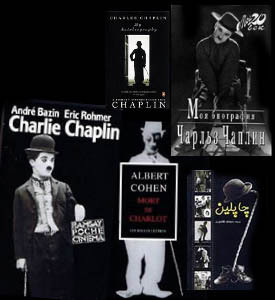 Hundreds of books have been written about Charles Spencer Chaplin, his life, his art, his movies. Books have been published about books, trying to recollect, classify and list them. Among them, Glauco VIAZZIs CHAPLIN E LA CRITICA (1955), Timothy J. LYONS A GUIDE TO REFERENCES AND RESOURCES (1972) and Lennarht ERIKSSONs BOOKS ON CHAPLIN (1981). To our knowledge, the latest edition of Erikssons work was in REFLECTIONS ON MODERN TIMES, by Adolphe NYSENHOLC, in 1991. In quite 15 years, dozens of new books have been published about Charlie or his creator and many of previously published works have been reedited. Some remaking is then needed. 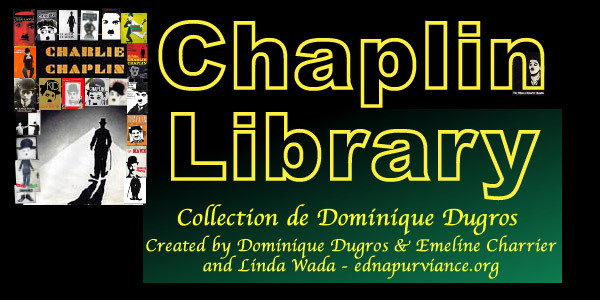 In its modest way, The Chaplin Library thus aims at illustrating and completing Lennarht ERIKSSONs precious work, in order to help Chaplin aficionados in finding books or references for their own research or collections. Of course, the library is far from being as exhaustive as was Erikssons work at its time. It is therefore open to any comments and/or corrections to improve it. We sincerely hope youll find what you were looking for, perhaps discover books you had never heard before, or simply enjoy having a look at those various covers, some of them being really nice and original. The Sea Gull "A Woman of the Sea" - From the Hill Family Collection, 55 never before seen production photos saved in Edna Purviance's personal collection with background on this lost production by Charlie Chaplin, directed by Josef von Sternberg. A Very Special Thanks to Dominique Dugros for the collection and all his help, as well from Emeline Charrier Dugros. This section would not have happened without you.The library will be updated with new covers for everyone to enjoy. Small banner above can be used for links.